start() This function is use to start the menu. You can set the parameter in action script and use this function to start the menu. getItems() To get the array of the menu item object. getItemAt() To get the menu item object as specified ID..
nextItem() Tell the menu goto next item. This only work with enableMouseScroll set to false. prevItem() Tell the menu goto prev item. This only work with enableMouseScroll set to false. gotoItem() Tell the menu goto the item with ID. This only work with enableMouseScroll set to false. Returns Array; Object array of the menu items. Description Method; get the Object array of the menu items. id: Number: id of the menu item. Returns MoiveClip; Object reference of the menu item. Description Method; Get the object reference of the menu item by specified id. Description Method; Move to next item. Description Method; Move to previous item. id: id number of each item. From left to right, 0 to item max. Description Method; Goto the item with specified id. Broadcast when mouse clicked on the item. onItemRollOver() Broadcast when mouse over on the item. onItemRollOut() Broadcast when mouse move outside the item after mouse over. onItemSelected Broadcast when the item moved to the center (i.e. move to center mean selected). The parameter determine if you want the menu to autostart. The parameter determine where the blur effect active or not. This effect is only supported in Flash Player version 8+. enableGetUrl Boolean Enable/disable getURL action of the items . enableItemEvent Boolean Enable/disable events of the items . enableMouseScroll Boolean Enable/disable mouse scrolling. Specfiy the scale of the item appear in the menu relative to it's orginal size. A array define the identifier name array of the symbols which use for create the menu. A array define the url link for each item in the menu. If you don't want the menu item appeared as a link or you want to define your action in your item, leave this array blank. A array define the url link traget for each item in the menu. If you don't want the menu item appeared as a link or you want to define your action in your item, leave this array blank. Determine the alighment of the menu item. The item can be align for top, middle or bottom. Determine the orientation of the rotation menu. The menu can be in horizontal or vertical. The parameter determine where the mirror effect active or not. This effect is only supported in Flash Player version 8+. The parameter determine where the perpective scaling effect active or not. The parameter determine where the perpective transform effect active or not. 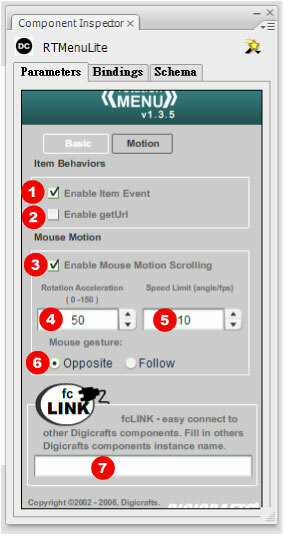 The parameter determine where the behaviour of the menu to the mouse gesture. The parameter determine where the perpective transform effect active or not. This parameter accepts values from 1 to 100. The parameter determine the speed limit of the rotation. The speed is measured in angle rotated per frame. Determines whether the component is enabled or not. Determines the visibility of the component. 1 autoStart The parameter determine if you want the menu to autostart when load. 2 menuOrientation Determine the orientation of the rotation menu. The menu can be in horizontal or vertical. 3 menuAlignment Determine the alighment of the menu item. The item can be align to top, middle or bottom. 4 globalScale Specfiy the scale of the item appear in the menu relative to it's orginal size. 5 instanceNameArray A array define the identifier name array of the symbols which use for create the menu. 6 itemLinkArray A array define the url link for each item in the menu. If you don't want the menu item appeared as a link or you want to define your action in your item, leave this array blank. 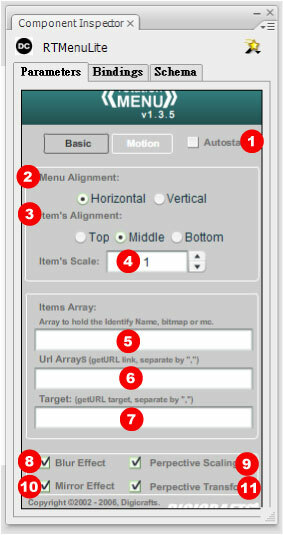 7 itemLinkTargetArray A array define the url link traget for each item in the menu. If you don't want the menu item appeared as a link or you want to define your action in your item, leave this array blank. 8 blurEffect The parameter determine where the blur effect active or not. This effect is only supported in Flash Player version 8+. 9 perspectiveScaling The parameter determine where the perpective scaling effect active or not. 10 mirrorEffect The parameter determine where the mirror effect active or not. This effect is only supported in Flash Player version 8+. 11 perspectiveTransform The parameter determine where the perpective transform effect active or not. 1 enableItemEvent Enable/disable events of the items . 2 enableGetUrl Enable/disable getURL action of the items . 3 enableMouseScroll Enable/disable mouse scrolling. 4 rotationSpeed The parameter determine where the perpective transform effect active or not. This parameter accepts values from 1 to 100. 5 rotationSpeedLimit The parameter determine the speed limit of the rotation. The speed is measured in angle rotated per frame. 6 enabled Determines whether the component is enabled or not.